Announcement Attention local shoppers! Please use coupon code "local" for no shipping charge if you'd like to meet at a pick-up location in Yardley, to be determined via convo. 5. Enjoy at room temperature! All truffles and bon-bons are made to be enjoyed at room temperature for the optimum flavor release. **Note: We reimburse shipping overages, as Etsy does not allow shipping calculations based on multiple items in one package. Attention local shoppers! Please use coupon code "local" for no shipping charge if you'd like to meet at a pick-up location in Yardley, to be determined via convo. Very quick shipping and lovely packaging. Tucked away as a present for my dad. Updated! Omg! Dad gave me one to try. It was pure chocolate delicious ness. I'll be getting some for myself. These are really great for wedding favors. So freshly made that you could smell the chocolate even before opening the canisters. We customized them with a sticker from the bride and groom and gave them out with a mini bottle of Schnapps! I don't drink hot chocolate but am waiting for my family to tell me how great it tastes. If it tastes anything like it smells it will be delicious!!! Thank you! Our ganache is made with local 40% butterfat cream, couverture chocolate, and finished with Kerrygold butter. 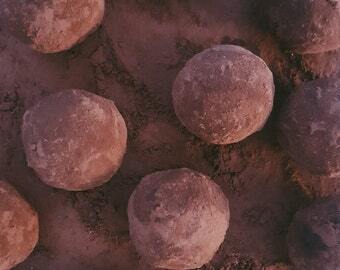 Our traditional truffles. Vanilla bean super dark chocolate ganache rolled in high quality cocoa powder. We use only couverture chocolate (>32% cocoa butter). Pictured is a dried cacao pod and cacao nibs (pure chocolate). We use the best quality Madagascan vanilla beans. Pavonia Confections is the culmination of many things besides great passion for chocolate and art. It also has much to do with timing, varying careers choices, and going back to school (again and again). I majored in English at Rutgers University and began work at Columbia Records following graduation - my dream. As it turned out, the atmosphere wasn't for me. But being impressed by the goodies I brought in occasionally for birthdays and such, my coworkers convinced me to try culinary school. After a year in culinary school, I moved to Philadelphia and came upon a job at Classic Cake with executive pastry chef Robert Bennett. Chef Bennett is the former pastry chef of Mobil Travel Guide four-star rated Le Bec Fin, and current Cacao Barry chocolate ambassador. I apprenticed with Chef Bennett and learned his chocolate artistry. After apprenticing with Chef Bennett, I fell into a job as a food technologist at a flavor house. After five years in the industry, I am now a food scientist at a flavor and specialty ingredient manufacturer specializing in confectionery science. The journey has ended (thus far) with Pavonia Confections. I hope to share the experience of artisanal gourmet chocolates with you. I use Cacao Barry couverture chocolate exclusively, and local ingredients whenever possible. I love the flavor of vanilla beans from the Madagascan region/Réunion Island. When not working as a food scientist at a flavor house, or going (back) to school for food science, Amanda is making chocolates. Chocolates are her third love, after her husband Dan, and Disney World.